Nanodiamonds synthetic industrial diamonds only a few nano meters in size have recently attracted considerable attention because of the potential they offer for the targeted delivery of vaccines and cancer drugs and for other uses. Thus far, options for imaging nano diamonds have been limited. Now a team of investigators based at the Athinoula A. Martinos Center for Biomedical Imaging at Massachusetts General Hospital has devised a means of tracking nanodiamonds noninvasively with magnetic resonance imaging (MRI), opening up a host of new applications. They report their findings in the online journal Nature Communications. Waddington began this work three years ago as part of a Fulbright Scholarship awarded early in his graduate work at the University of Sydney, where he is a member of a team led by study co-author David Reilly, PhD, in the new Sydney Nanoscience Hub the headquarters of the Australian Institute for Nanoscale Science and Technology, which launched last year. As part of the Reilly group, Waddington played a crucial role in early successes with nanodiamond imaging, including a 2015 paper in Nature Communications. He then sought to extend the potential of the approach by collaborating with Rosen at the Martinos Center and Ronald Walsworth, PhD, at Harvard University, also a co-author of the current study. Rosen’s group is a world leader in the area of ultra-low-field magnetic resonance imaging, a technique that proved essential to the development of in vivo nanodiamond imaging. Previously, the use of nanodiamond imaging in living systems was limited to regions accessible using optical fluorescence techniques. 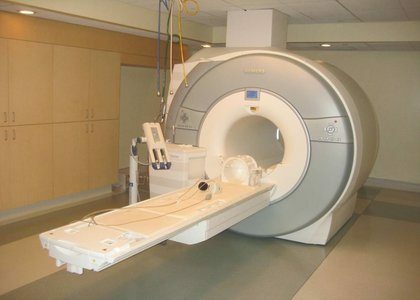 However, most potential diagnostic and therapeutic applications of nanoparticles, including tracking of complex disease processes like cancer, call for the use of MRI the gold standard for noninvasive, high-contrast, three-dimensional clinical imaging. In the present study, the researchers show that they could achieve nanodiamond-enhanced MRI by taking advantage of a phenomenon known as the Overhauser effect to boost the inherently weak magnetic resonance signal of diamond through a process called hyperpolarization, in which nuclei are aligned inside a diamond so they create a signal detectable by an MRI scanner. The conventional approach to hyperpolarization uses solid-state physics techniques at cryogenic temperatures, but the signal boost doesn’t last very long and is nearly gone by the time the nanoparticle compound is injected into the body. By combining the Overhauser effect with advances in ultra-low-field MRI coming out of the Martinos Center, the researchers were able to overcome this limitation thus paving the way for high-contrast in vivo nanodiamond imaging over indefinitely long periods of time.